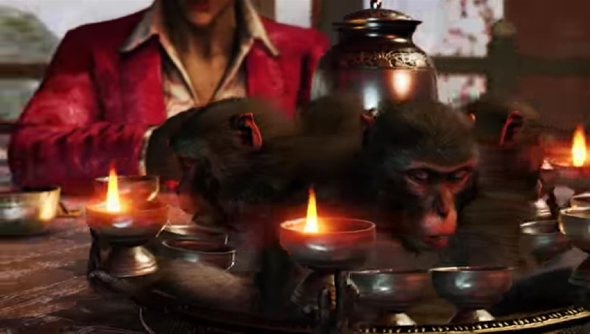 Far Cry 4’s latest trailer pulls out all the stops, tigers turning into snow, paint explosions, and a dinner spread of monkey heads. Ubisoft are throwing everything at the screen to get our wallets pre opened for the 18 November release date. Far Cry 4’s certainly going for variety of terrain with its Himalayan setting. There’s the lower altitude jungle and desolate mountain sides but as you get higher it becomes positively arctic. Hopefully there’ll be opportunities to jump a snowmobile off a snowy clifftop into a warm, elephant-filled lake. Also, all the fun with animals seems set to make a return: releasing leopards onto a bunch of unsuspecting guards will definitely be my first port of call when I get my hands on Far Cry 4. My worry, though, is that while the game’s seen a dramatic shift in scenery since Far Cry 3 that not enough has changed to warrant this sequel. I adored Far Cry 3, it made it into my top shooters list, and I’m confident I’ll have silly fun with Far Cry 4 but there’s nothing I’ve seen so far that’s made me excited for its release.